Store Home > Style "C III"
The "C III" Style is the smallest version of the "C" shape at approximately 1.03" wide by 1.00" tall. LIMIT OF TWO PER EACH PICK OPTION PLEASE. A few years ago I became aware of how much a pick affects your tone and playing. Until that time I typically used your standard Dunlops or similar picks and simply wasn't aware of how important pick choice is as you become a stronger player. I began quite a journey finding the "pick" for me (I play both electric and acoustic), and spent quite a lot of $$$ in the process. I really have tried them all ... with the exception of genuine tortoise shell. I've tried all materials, guages, shapes (tip and style), and bevels. For a while I was even using mammoth tusk picks (nice but raspy). The particular style (size, shape,etc.) is pretty subjective, but I have found that heavier gauges (e.g. XH) allow me to have better dynamics and accuracy. 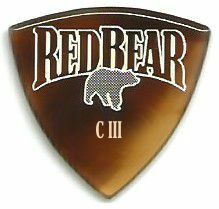 When I discovered Red Bear a few years back I was sold on the tone and feel. The material glides across strings and has a clear, clean, organic tone (particularly noticeable on acoustic). I use a right-hand bevel, and the workmanship in the beveling, shaping and finishing of these picks is unsurpassed. I still try out other products on occasion (e.g. Gravity Stealth), but none really come close to matching these. 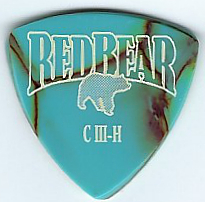 This all said, Red Bear picks do require some care (and they do cost quite a lot ... so don't lose 'em). Definitely get their pick care kit! I don't need to re-bevel very often, but I do use the special "oily stuff" to help avoid deterioration of the pick's surface. This only takes a minute and I do it about as often as I change strings (e.g. every couple of weeks). Bottom line: These picks are well worth the price. You will not be disappointed in their tone, quality, or the degree to which they can improve your technique and dynamics. Highly recommended!